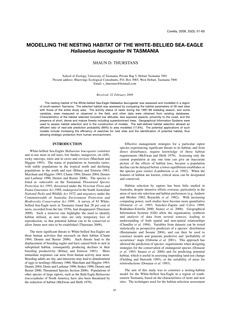 The nesting habitat of the White-bellied Sea-Eagle Haliaeetus leucogaster was assessed and modelled in a region of south-eastern Tasmania. The selected habitat was assessed by comparing the habitat parameters of 28 nest sites with those of the entire study area. The activity status of nests during the 1997� breeding season, and some variables, were measured or observed in the field, and other data were obtained from existing databases. Characteristics of the habitat selected included low altitudes, less exposed aspects, proximity to the coast, and the presence of short, dense and mature forests including superdominant trees. Geographical Information Systems were used to assess habitat selection and in the construction of models. The well-defined habitat selection allowed an efficient ratio of nest-site prediction probability (89%) to area modelled (17.8%). The potential applications of such models include increasing the efficiency of searches for nest sites and the identification of potential habitat, thus allowing strategic protection from human encroachment.